After over 30 hours of extensive, in-depth testing, we found that the Optima Batteries 8016-103 D34M BlueTop offers the best value out of all marine batteries we tested. Its great dual purpose performance and outstanding results for both starting and deep-cycling, with an affordable price to boot, make it the best marine battery for most people. The Optima Batteries 8016-103 D34M BlueTop is a dual-purpose marine battery that offers the best from both worlds- with 870 MCA, 750 CCA and 200 minutes of reserve capacity, it will cover both your starting and deep-cycling needs. This high-performance AGM battery is spill-proof and maintenance-free, which combined with exceptional vibration resistance and fast recharge, makes it the best marine battery for most people. With an 1150 CCA value and 205 minutes of reserve capacity, Odyssey 31M-PC2150ST-M dual purpose marine battery is worth the extra money. This marine battery excels at both starting and deep-cycling, with 2 times the overall power and 3 times the life when compared to most marine batteries. In our tests, it proved to be a reliable and really powerful battery, with heavy-duty starting power and excellent deep-cycling capability. If you’re looking for a dependable deep-cycle marine battery that is not too expensive, the VMAX857 AGM Battery is the best option. With a 75 minutes of reserve capacity, it’s not as quite as powerful as our dual-purpose top and step-up pick, but even with less power, this marine battery still offers a decent performance. What are marine battery used for? Can you use a marine battery to start your car? There are many different marine batteries on the market, but, before making a decision, you should gather all the information you need, starting with the basics. When it comes to marine batteries, the first thing you should consider when purchasing is which of the three chemical types of marine batteries you should choose- flooded, gel or AGM batteries. Otherwise known as wet batteries, they are the cheapest and most common type of batteries used. Based on traditional lead-acid technology, they use a system of liquid sulfuric acid reservoir placed between the lead plates, which acts as a pathway for electrolyte production. However, being cheap comes with a price- this type of batteries needs vented box, regular inspection, and maintenance. You should also be aware that flooded batteries carry the risk of spillage, which can cause corrosion and damage, and they do not handle vibrations that well, which is a letdown for boat owners. The electrolyte in this type of batteries contains sulfuric acid, fumed silica, pure water, and phosphoric acid. Before the battery is sealed, the electrolyte is gelled with silicates, hence the name. Although they are safer than flooded batteries when it comes to the risk of spilling, this type of batteries charge at a lower voltage, which increases the possibility of high-voltage overcharging. Instead of using a liquid electrolyte like gelled or wet batteries, AGM batteries rely on a different technology altogether. The sulfuric acid in the battery is being absorbed by fiberglass mat, which makes the AGM battery spillproof. This advanced technology makes for lighter batteries and very low internal resistance, which gives them better starting power and long service life. In addition, AGM batteries are the best for use on boats since the have an extremely high vibration resistance, and won’t be damaged if submerged in water. In addition to these three types, you can also find lithium technology marine batteries. This type of battery is the newest on the market, and they use lithium metal instead of lead. Although they do have great performance, they are also the most expensive ones, which doesn’t make them as popular as other chemical types of batteries. There are two different applications for marine batteries- you can either use them for starting the boat or for powering up your boat when you’re on open water. However, there’s a third option- dual-purpose batteries, which offer a solution for both deep-cycling and starting. This type of marine battery is used for starting the boat’s engine and in order to successfully do it, they are designed to output short, sudden bursts of power. This is enabled by their customized design, which means they are equipped with a larger number of thinner lead plates, to allow short high-powered bursts of current. Designed for cranking, thin plates are also more fragile, so their longevity will be reduced by harsh climates and environmental impacts, as well by using them to power up your boat, instead of only starting it up. If you want to power up appliances on your boat, you’ll need slower intervals of current that last for extended period of time, and deep-cycling marine batteries have thicker lead plates. Deep-cycling marine batteries also have fewer plates, which combined with their thickness, allows the battery to hold a charge better, with slower overall draining. In case you try to start up your boat with a deep-cycling marine battery, you might find yourself unable to do it, since this type of battery isn’t designed to provide that cranking power needed for starting. Suitable for both deep-cycling and starting, this type of battery is perfect for small powerboats or boats that have room for only one battery. Even though people prefer to have separate, dedicated batteries for different purposes, dual-purpose batteries are in some cases the only option, or the best one- if you’re looking for an affordable and practical solution. Dual-purpose batteries are reliable and have good performance in both categories, however, the best results for large boats are obtainable only when you have a dedicated battery for both deep-cycling and starting. Using a marine battery if your car’s battery suddenly dies and you only have your boat’s battery around is OK, but it certainly doesn’t mean you’ll get the results you expect. First of all, it might not fit into your car, especially if it’s not an AGM battery (which are lighter than other types of marine batteries). If it’s a deep charge marine battery, chances are you won’t be able to start your car, due to the lower cranking power of this type of marine battery, and in case you do have a starting or dual-purpose battery in your boat, it doesn’t mean that CCA value will be compatible with your car. However, even though this use of marine batteries isn’t encouraged, in urgent case you can try, at a risk to your car’s performance, start your car using a marine battery. If you’re lucky, you’ll be able to start it, but, there’s a higher chance a marine battery won’t be helpful ith car trouble. Using a marine battery in your car doesn’t offer any advantage whatsoever, so there’s no reason for you to choose it over a car battery. MCA, or marine cranking amps, rating indicates the amount of amps produced while starting the engine, with the temperature being 32 degrees Fahrenheit. Of course, the greater MCA rating is, the better, but have in mind you should choose marine batteries only with the same or higher MCA rating than the one recommended for your boat’s engine. Same goes for CCA, or cold cranking amp rating, which tells us the amount of amperage battery can produce in conditions where the temperature is ) degrees Fahrenheit. The minimum CCA rating we considered is 500 since anything below that would cause trouble in cold temperatures. RC or reserve capacity is an important time measurement for deep-cycling and dual-purpose marine batteries. It indicates how long a fully charged battery will deliver 25 amps of current in an 80°F-environment before the battery is depleted down to 10.5 volts. He higher RC rating is, the longer will the battery be able to keep your boat powered up before draining out. Average batteries usually have RC rating around 90 minutes, but in order for a marine battery to be the best choice for most people, an RC rating higher than that should be expected. When it comes to marine batteries, standard rating considers 20 hours, so if a marine battery has a 50 amp hour rating, it means that the battery will discharge 2.5 amps per hour during that 20 hours. Of course, higher amp hour ratings indicate more power for a longer period of time, so high amp hour rating was an important factor for deep-cycling and dual-purpose batteries. Every type of battery has some advantage based on the technology used for manufacture, whether the low cost or higher performance. We were looking mostly at marine batteries that offer the best value, which means they offer great performance while keeping the price affordable. The best marine batteries, considering our tests, were AMG batteries, which, although cost a bit more than flooded or gel ones, offer a lot more than other types. For boats, it’s crucial for a battery to have high vibration resistance since it’s essential for boat riding and to be spillproof, as to avoid any potential damage to the boat. Whether you need a reliable battery for starting up your boat’s engine or a deep-cycling battery that can efficiently power up all the appliances on it, the Optima Batteries 8016-103 D34M BlueTop has it all. With 870 MCA value, you certainly won’t have any trouble starting the engine, and solid 750 CCA rating ensures that you can crank it up equally fast even when the temperature starts dropping. What we loved is that 8016-103 D34M BlueTop has high cranking rates for both categories, and that ensured that this marine battery performed great in our tests, regardless of the weather conditions. When it comes to reserve capacity, this marine battery has 120 minutes RC value, which is well above the average and ensures constant and unwavering performance. Optima batteries have a specific, trademarked design which enables them to really overachieve in both categories- ultra high-performance SpiralCell Technology, and spiral winding continuous pure lead plates make this battery really energy-dense. In our tests, this marine battery proved to be quite a beast, and it could hold a charge like no other, which was really impressive. 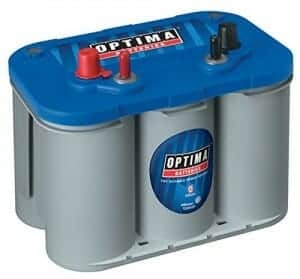 Since Optima Batteries 8016-103 D34M BlueTop is also an AGM battery, it has glass mat separators that allow you to position this battery any way you like without fearing something will spill out of it, or that the performance will deteriorate. Using Absorbed Glass Mat technology is also what makes this marine battery maintenance-free, so you won’t have to go through the hassle of constant checking, adding water or fearing something will go wrong if you don’t inspect your battery every time you use it. The last thing you want when you’re on open water is to be stuck with an undependable battery that could leave you stranded, and that’s a scenario that is highly unlikely with Optima Batteries 8016-103 D34M. Highly customized design and first-class technology behind this marine battery are the reason why it has more than 15 times the vibration resistance when compared with most other marine batteries. When it comes to boats, this is really a big plus, since most batteries don’t handle vibration all that well, so there’s risk of malfunction and damage. 55 Amp hour rating only contributes to great charge of this marine battery, so count on being surprised (as were) as to how it holds out even when you power up a lot of appliances on your boat. As far as cycling capability goes, Optima Batteries 8016-103 D34M recharges up to 3 times faster than most other marine batteries, so you won’t have to worry about charging in a hurry, as long as you use a recommended, high-quality charger. The impressive performance of Optima Batteries 8016-103 D34M BlueTop during our tests is obviously something a lot of people experienced when they bought this marine battery, according to its Amazon reviews. It seems that the quality of this marine battery is already recognized by a lot of people who think this is the best marine battery on the market, and we can’t agree more. Being a dual-purpose marine battery, Optima Batteries 8016-103 D34M BlueTop might not have the great performance it usually has if it’s used on a bigger, more powerful boat. For most regular boats, this marine battery will be top-notch, but, for bigger boats, it’s recommended to use two separate batteries, one for starting only and one for deep-cycling. However, most people are not searching a battery for big boats to install themselves, so for the majority of people, ho have a boat for fishing or casual weekend trips on the lake, this marine battery will be more than enough. If you’re looking for some really serious power, it’s worth to invest a bit more and go for the Odyssey 31M-PC2150ST-M, that excels in heavy-duty performing. It has 1370 MCA rating, 1150 CCA and additional 2150 PHCA rating (Pulse (5-second) Hot Cranking Amps),which all makes for massive starting power, in various different conditions. When it comes to its reserve capacity, Odyssey 31M-PC2150ST-M doesn’t disappoint- with 205 minutes of RC, you can count on this marine battery to keep you covered on your fishing trips. For added power, his marine battery also has 100 amp hour rating, which, combined with its other impressive ratings, guarantees first-class performance. What we really loved is how fast this battery recharges. Not only it will hold a charge impressively long enough considering the competition, this battery will completely recharge in a matter of 4-6 hours, so you’ll have a battery that not only maintains power for an impressive amount of time, you’ll get to a 100% recharge faster than you would with any other AGM marine battery on the market. Using AGM technology for this marine battery comes with additional perks. Not only this battery is maintenance-free, you can mount it in virtually any position without fearing leakage since it’s spillproof. This battery also has a high vibration resistance, for both high-impact shock and mechanical vibration, so your boat’s battery won’t die on you if the waves start hitting hard. In addition to having massive cranking power for a wide range of different weather conditions, this marine battery also has an extreme temperature tolerance. Operating temperatures from -40 degree Fahrenheit to 176 degrees Fahrenheit make this marine battery suitable for both extreme cold and high heat. Comparing Odyssey 31M-PC2150ST-M to other marine batteries, we realized that it has longer cycle life, up to 70%, which means you’ll get high, stable voltage for an extended period of time. All things considered, if you’re not limited by your budget, the Odyssey 31M-PC2150ST-M is a safe choice, and its powerful performance won’t disappoint you. If you’re not looking for a dual-purpose battery, or you’re on a budget, you should consider VMAX857 deep-cycle marine battery. Although using deep-cycle batteries for cranking your motor isn’t recommended (since their design isn’t compatible with short, high-powered bursts of current), you can still use this battery to start your boat, if you’re in a tight spot. With MCA 390 value and CCA 300 rating, you can’t expect anything above the average, but, as we mentioned, deep-cycle batteries are not supposed to be used as starting batteries, so low rating isn’t much of a surprise. For a canoe or kayak, or shorter trips, reserve capacity of 75 minutes and 35 Amp hour rating will be enough, but, if you’re planning on powering many different appliances on your boat, you might want to look at something more powerful. As other AGM batteries, VMAX857 is also spillproof and maintenance-free, so you won’t have any problems with leaking that could damage your boat. A welcome addition to this particular marine battery is the use of high-quality tin-lead alloy for their plates, which is significantly better than other alloys used for budget marine batteries. If you’re looking to install starting and deep-cycle batteries separately, rather than using a dual-purpose one, we recommend Optima Batteries 8006-006 34M. Optima batteries are well-known for their durability and outstanding performance, and 8006-006 34M is not an exception to the rule. Their unique, patented SpiralCell technology puts them ahead of other batteries on the market, and their innovative design delivers greater starting power, amongst other advantages. With 1000 MCA and 800 CCA rating, this marine battery has a great cranking power. Powerful performance is ensured by 100 minutes of reserve capacity and 50 Amp hour rating, so you can count on a long and superior performance. In case you want a dedicated marine battery for deep-cycling, you can’t go wrong with the Vmaxtanks MR137 marine battery. When it comes to deep-cycling, this marine battery is truly a beast, and it can overcome your highest expectations with its massive power. Rated with 120 amp hour and with a reserve capacity of 230 minutes, it’s a serious heavy-duty marine battery for deep-cycling. With Vmaxtanks MR137 you’ll get more power than with any other marine battery, and for a longer period of time between charges. With a good starting battery to combine with it can provide you with overall best power for your boat, but in case your dedicated starting battery dies on you, you won’t be left stranded with Vmaxtanks MR137 and its 900 MCA rating, and 1740 HCA rate (Hot Cranking Amps). Like other AGM batteries, this one is also maintenance-free and spillproof. In case our top pick or step-up pick aren’t in stock, UB121000 is also a good choice for boats with trolling motors. With 100 Amp hour power, you can rely on this marine battery to take care of your needs, both for starting and deep-cycling with a trolling motor. Since it’s an AGM battery, it is spillproof and maintenance-free, so you won’t have to replace it often or risk damage like you would with other marine batteries. It’s also very resistant to strong vibrations, which is an important quality for batteries that are intended to be used with trolling motors. If you’re looking for a dependable marine battery for your backup sump pump, MK Deep Cycle Gel Cell is the best choice. Gel technology ensures maintenance-free and spillproof qualities, so it’s a “no-fuss “system. Its 99.5 Amp Hour rating ensures durability and long charge hold, so you can rest assured your backup sump pump will be up and working during a shortage or a blackout. It really is a heavy-duty backup battery and has much better results than other commonly used batteries. Since it’s a marine battery, its performance is already top notch, and using modern gel technology only improves the overall capacities. Although we haven’t had the chance to check it, MK Deep Cycle Gel Cell marine battery is advertised to have a long life, with an average 7-8 years before you need to replace it. Considering how well it operates, extraordinary longevity is just another bonus for this marine battery. Marine batteries are often fully compatible with RVs, but if you want a trustworthy battery that will keep all of the accessories in your RV running for a longer period, choose Exide XMC-31 MEGACYCLE AGM-200. This heavy-duty marine battery will provide more than enough power for your RV, with its 200-minute reserve capacity and 100 Amp hour rating. It’s truly an overachiever when it comes to holding a charge, so you won’t experience any trouble on the road, and you’ll be able to fully enjoy all the accessories and appliances of your RV. Since it’s a dual-purpose marine battery, you can rely on it for starting, too, and with impressive results- 925 CCA and 1110 MCA (or, in the case of RV, CA) rating make for truly massive cranking power. Using AGM technology guarantees that this marine battery is spillproof and maintenance-free, which means you can mount in any position you need it, without fearing leakage. You can also forget about adding water and regular inspections, thanks to this advanced technology that prevents dry-out. Marine battery of this caliber means you’ll get to enjoy your road trip more than you ever did before, and with much more power, too. If it’s one of those days when the wind is just not on your side, you’ll need a dependable marine battery to power up your engine, and a good choice for sailboats is Exide Edge FP-AGM24D. If you need to crank up your engine, you can count on its 775 CCA rating and 930 MCA to start it up easily, regardless of the weather conditions. If you just want to power different electrical loads on your sailboat, Exide Edge FP-AGM24D will take care of that too, with its 145 minutes of reserve capacity and 72 Amp hour rating. It’s an AGM battery, so it’s spillproof and maintenance-free. This also means it has a higher vibration resistance and virtually no risk of spilling, so you can sail with ease. If you’re looking for a perfect battery when taking out your bass boat to go fishing, you can always check out our top or step-up pick as suggestions for your best choice. In case you’re not able to get one of these, Odyssey 34M-PC1500ST is also a good choice. With an 880 CCA rating and 1500 PHCA rating to boot, you’ll always have a secure starting option whether you’re on open water or at the dock. When it comes to maintaining the charge, 135 minutes of reserve capacity and 68 Amp hour rating are more than enough to keep you covered. For when you’re not using the boat, you won’t need to check up on your battery, since AGM technology ensures it’s maintenance-free and spillproof. When you’re looking for a solid, reliable battery to use for both starting and deep-cycling, that will allow you to enjoy your fishing trips without any hiccups, this marine battery is definitely a good choice. Q: Does “maintenance-free” really means that the battery needs no maintenance at all? A: According to an article from On The Lake , it doesn’t mean you won’t have to take care of your marine battery, even though it’s labeled maintenance-free. When it comes to AGM batteries, which are sealed off, which we mostly recommended in this article, it means you’ll have to watch if it’s left fully charged after use. In case you tend to leave it in your boat partially charged, it might affect its performance in the long run. Q: How long can I expect my battery to last? A: It all depends on how you use it and how well you maintain it. An article from Batteries in a Flash estimates life of marine batteries anywhere between 1 and 6 years. Some of the models we tested advertise even higher life expectancy, but, again, you should always factor in the use and care. Q: Should I fully discharge my AGM marine battery? A: No, it’s not recommended. According to Battery University, you shouldn’t let the charge drop under 50%. However, if it happens that you fully discharge your AGM battery, there are ways to” revive” it, like the one featured in Hot Rod magazine. Whether you’re an outdoor enthusiast which loves spending time on the water, or you live for those fishing trips on the weekends, it’s essential to equip your boat with a reliable battery. If you’re looking for an overall overachiever, Optima Batteries 8016-103 D34M BlueTop will fulfill your expectations. When you need to up your game a bit more, invest in Odyssey 31M-PC2150ST-M for heavy-duty starting and deep-cycling power. And, when you’re on a budget, take a look at VMAX857 AGM Battery for a reliable deep-cycling performance, and a dependable emergency starting battery.